Rod Rosenstein, who faces his confirmation hearing next week for the role of deputy attorney general, was appointed top federal prosecutor in Maryland by George W. Bush. WASHINGTON: Some Democrats worry the appointment of a Jeff Sessions subordinate to oversee an investigation into Russian interference in the 2016 election won't be a clean enough break from the embattled attorney general. But the veteran prosecutor in line for the job may be uniquely politically palatable. Rod Rosenstein, who faces his confirmation hearing next week for the role of deputy attorney general, was appointed top federal prosecutor in Maryland by George W. Bush and remained in the post for the entire Obama administration. That staying power, extraordinary for a position that routinely turns over with changes in the White House, lends weight to the reputation he's cultivated as an apolitical law enforcement official. "He is so well-respected. 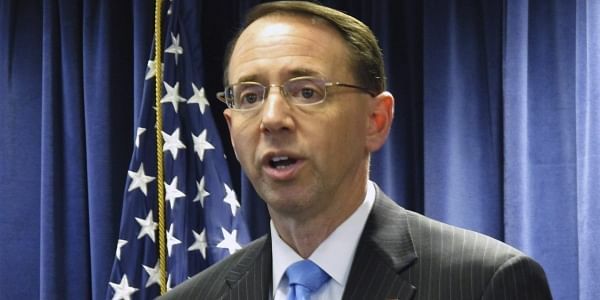 He cannot be influenced, he cannot be bought, he cannot be pressured because of outside political forces," said Baltimore criminal defense attorney Steven Silverman, who has known Rosenstein for years. Sessions recused himself from any Trump-Russia investigation Thursday after the Justice Department acknowledged he had spoken twice with the Russian ambassador last year and had failed to disclose the contacts during his Senate confirmation process. Sessions said he had not tried to mislead anyone but could have been more careful in his answers. The new attorney general's recusal handed authority for an investigation â for now â to his deputy, Dana Boente, another longtime federal prosecutor who has the post in an acting capacity. Boente was appointed U.S. attorney for the Eastern District of Virginia in 2015 by Barack Obama and was elevated to acting attorney general in January after Trump fired Obama holdover Sally Yates. When Sessions won confirmation, Boente stepped to the No. 2 position. Once Rosenstein is confirmed, he'll take over responsibility for any probes touching the Trump campaign and Russian meddling. He arrives at the Justice Department with experience in politically freighted investigations, having earlier in his career been part of the Clinton-era Whitewater independent investigation. When he was a U.S. attorney, his office also led the leak prosecution of Thomas Drake, the former National Security Agency official who pleaded guilty to a minor misdemeanor after more serious charges of mishandling documents were dropped. He more recently oversaw the probe of James Cartwright, the former Joint Chiefs of Staff vice chairman who admitted making false statements during a separate leak investigation and was ultimately pardoned by Obama. "It's hard to imagine a more challenging environment in which to come in as the deputy attorney general than what we have now," said Jason Weinstein, who served under Rosenstein in the U.S. attorney's office in Maryland. "Having said that, I can't imagine a better person for the job right now than Rod." Regardless, the Sessions recusal did little to assuage demands from some Democrats that the investigation be removed entirely from the Justice Department and given to an outside prosecutor. Rep. Adam Schiff of California, the top Democrat on the House Intelligence Committee, called the Sessions recusal "deeply inadequate" and said he was troubled by the number of Trump associates who he contended have either made misleading statements or concealed communications with Russia. "I also think for the public to have confidence that any prosecutorial decision is made truly independent of the administration, that the extra remedy of a special counsel is really warranted here," Schiff said in an interview. There is precedent for the selection of a special counsel by the Justice Department for especially sensitive investigations, though there's no indication yet that federal officials are planning to seek such an appointment. One prominent example was in 2003, when the Bush Justice Department turned to Patrick Fitzgerald, then the top federal prosecutor in Chicago, to investigate who leaked the identity of Valerie Plame, a covert CIA officer. That appointment was made by James Comey, who at the time was deputy attorney general and now is director of the FBI. "I think if the decision is made to bring someone in from the outside, it's not because the department can't do it and can't do it well," said Weinstein, now a Washington lawyer. "It's because in this politicized environment, the public's faith in the integrity of the investigation is so important and the department will want to bend over backward to put in place measures to ensure that the results of the investigation weren't questioned."